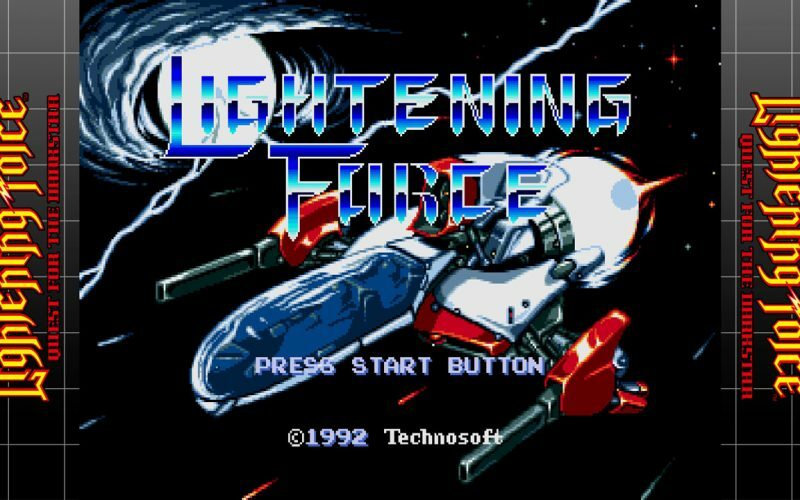 In my search for the best shmup games I stumbled upon this new title from the Sega Ages line: Lightening Force. Unlike most shmups, this one was among the few that I had never truly heard about. Might be because I wasn’t a Sega kid, although I do know about most of the relevant Sega titles, and yet this one eluded me for the longest time. The one way to fix this was to see for myself if I was missing anything. I wasn’t. The premise of the game is pretty simple. You play as this ship called Rynex in a campaign against bad guys. Apart from the initial cutscene and the ending, there isn’t much story in the game itself. There is a lot of lore surrounding the game, but I found most of it outside the game. Gameplay is where it’s at. Lightening force plays as an horizontal shoot ’em up game. What makes this game stand out are the speed and weapon systems. For speed you can adjust how fast you move with the press of a button. You can go from 25% to 100% speed, perfect way to adapt to either tricky navigation sequences or fast-paced battles. As for the weapons, you have 5 different weapon types but only start with 2 of them: the straight shot and the front and back shot. Getting the rest of the weapons requires you grab power-ups which drop from enemies in the game. Your base weapons can be upgraded too for extra power! The only downside is that death takes away your currently equipped weapon (or downgrades it if you were using the base weapons). Another very cool feature of the game is that you can pick the order in which you can go through levels. You have a set of 4 levels and you can play them in any order you want. There still is a “Level 1” and a “Level 4” with their respective difficulties, but you are free to start on the hardest level 4 and go making things easier. Unfortunately, this only applies to the first 4 levels, and the other 6 will have a forced sequence. Oh yeah, this is a 10 stage game. Before proceeding to discuss the game I’d like to point out how beautiful the Sega Ages packaging truly is. The amount of options it offers from replays, leaderboards and even save states is amazing. The interface is also very clean and easy to navigate. The way it allows for old games to incorporate nice modern features truly has me hoping for the next titles for the Sega Ages line. It always feel hard to critique an old game, because the design principles have evolved a lot in the 20+ years between the release and this review. And yet, I would be doing everyone a disservice if I attempted to review this game as if it were the 90s, because that’s not the case and it is necessary to do a modern review if this game is to compete against more modern shmup options for the players. With that being said, I feel like the graphical side if the game is a double-edged sword. 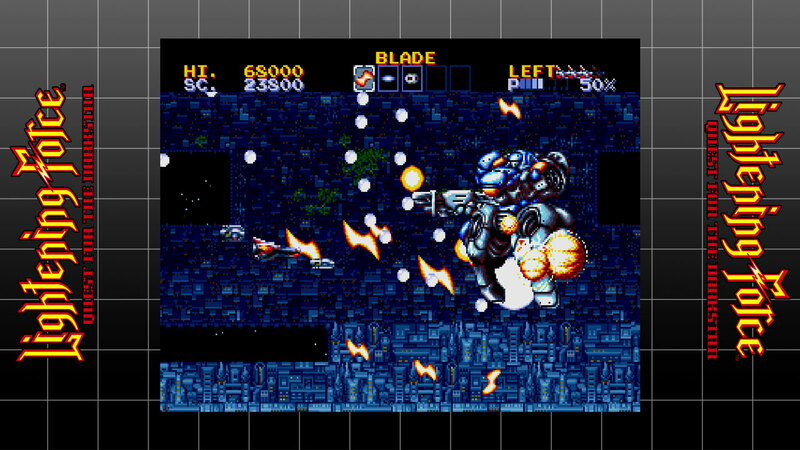 The game features the beautiful style of the Mega drive games. The ship is colorful and detailed, the background have multiple scrolling layers that add depth to each level and the huge bosses are a sight to behold… at least when considering the graphics of the era. However, all these shiny colors make anything hard as balls to see in the game. A very common thing that will happen is that the background and the foreground will mesh together, effectively blinding th player from incoming dangers. While you are flying through the blue/purple-ish background clouds, there a bunch of blue fighters coming your way in their military grade camouflage. It’s not all similar colors blending together though. A lot of the design of enemy bullets fails to properly distinguish itself. Some of my earlier deaths were due to my trying to collect an orange orb that looks like a power-up from any other shmup, only to discover it was actually an enemy bullet. Usually when comparing certain elements of a game I think of the 2 shmups which I consider the current gods on the Switch: Danmaku Unlimited and Ikaruga. If you played those games, then you already know that the enemy bullets are fighters are designed in a way to stand out from everything else and make it easier for the player to distinguish danger from safety. This is something that is completely absent in Lightening Force. As mentioned before, this likely derived from the evolution in design and art principles for games. One of the biggest features of the game are the huge vertical levels. Perhaps this sounds confusing, why did I describe this as an horizontal shmup a few paragraphs back? 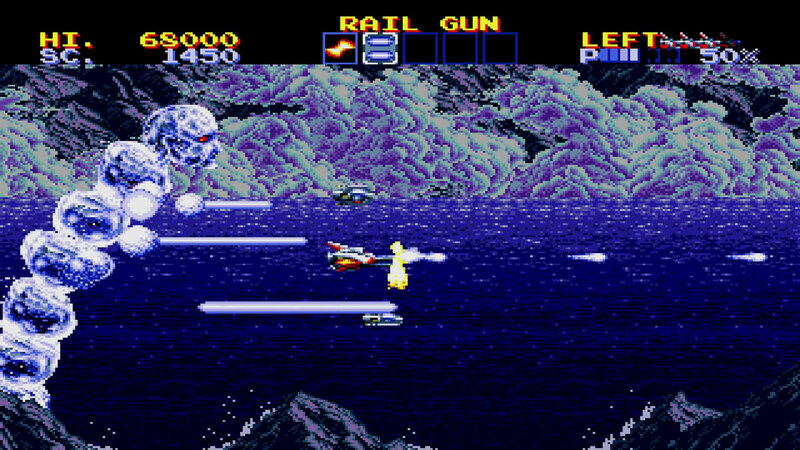 What makes this game an horizontal shmup is the fact the stages scroll horizontally, but that doesn’t mean that there can’t be a bigger vertical space than the norm. Just like the graphics, the vertical space of the stages is another instance of ambitious design gone wrong. One of the advantages of having more vertical space is that you can inject more variety into your levels. A very good example of this comes from an icey stage where you can hangout underwater at the bottom of the level, or stay near the surface at the top. One of these paths offers careful navigation between the ice, while the other is more combat oriented. It sounds cool and all, but eventually you realize that having more vertical space than what the screen can display is another way for danger to hide away from you. For a game that encourages you to increase your speed to zip through the level, you are constantly reminded that enemies are everywhere, and running into them from your blindspot is a very real threat. Speaking of blindspots, the game has the terrible habit of spawning enemy fighters from your behind. Perhaps as a way to showcase the uses of the backshot, nevertheless they fly in without any warning and rather than teaching you to not hangout at the back of the screen, you are left thinking that it was a very cheap kill. I’ve always been very vocal about difficulty and how it is implemented into the game, it is sad to say that Lightning Force just lands on the wrong side of it. A very bad habit of old games is that they feel like they are truly trying to kill you. Of course, every game does this, but there is a clear difference between games which will kill you if you aren’t careful, and games whose ultimate goal is to see you start over. Once again, this is probably a product of an era where a game’s longevity was determined by how long it took you to finally clear the game. In those years, games that deliberately kept you from finishing them usually had more playtime as long as you didn’t left frustrated. In Lightening force the difficulty comes from 2 factors: trying to take your lives, and preventing you from proceeding. The easiest way to explain the first one is by taking into account how enemies charge at you from off-screen, and how insanely fast some of the enemy attacks are. Think of an enemy boss instantly firing a high speed bullet without any sort of warning. This evokes the old habit of always being moving in random directions to avoid these. The second factor comes from how much of a bullet sponge the bosses are. The bosses just feel like they never die and overall take more time than your typical boss. There is a chance that this is more a perception issue, and that’s because the enemies don’t give the typical feedback to the player that they are taking damage. Think of a game like Aerofighters and how the parts of an enemy flash yellow and then red as they take damage. That kind of feedback is absent, and I was constantly wondering if I was doing any damage at all the the boss. Well, there is a slight feedback in the shape of blue and red explosions from your shots when colliding with the enemy, but I can’t properly say what the difference is. I was pretty excited when I began playing this game, but the excitement quickly died out when it showed its true colors. While the graphics are pretty good for a Mega drive game, they have their downsides. The gameplay is something I would consider slightly below average. It carries the feeling of excitement when you boot the game, but halfway up you are just wishing it was finally over. Truly one of those games which might have been good in their current times, but didn’t age well to a modern standard. Cada que le pido algo a Alexa, le doy las gracias. Cada que me toca un uber con medalla de "Excelente conversación", me agüito un poco. Que chido que haya excelente conversación, pero a veces no tengo ganas de que un extraño me haga plática.